I am happy to introduce the new me. The new, super dooper organised me! Yesterday I sorted out all the household accounts: the banking, the bills, the spending. It took all day and lots and lots of accountancy papers and ink and tipex and a few naughty words but we got there in the end. Today I have sorted out the website: boy was it dusty and disorganised. I had things in one part of the shop that should have been in another and between you and I, it has been so long since I have been on it, I couldn't even remember my password. That is truly shocking really isn't it? I now work from 9.00 am until 17.30. I have to: I have to be organised and achieve lots if I am going to be like Alexie on Dynasty (showing my age now) and run a successful business and get some quality of life. I don't know what you are like but I'm a shocking procrastinator! I think lots and do little. Now however, this is a brand new me! This way, I work, design and achieve, and then in the evenings I can do whatever I like craft wise...fun. And so far (two days in) it seems to be working. I have even spent the day re-designing and updating a chart which never actually got released officially. Carolyn Nye was super kind and stitched it for me; the stars pattern does run red, white and blue but I boobed: I have sorted it out on the chart now and it is ready to go. 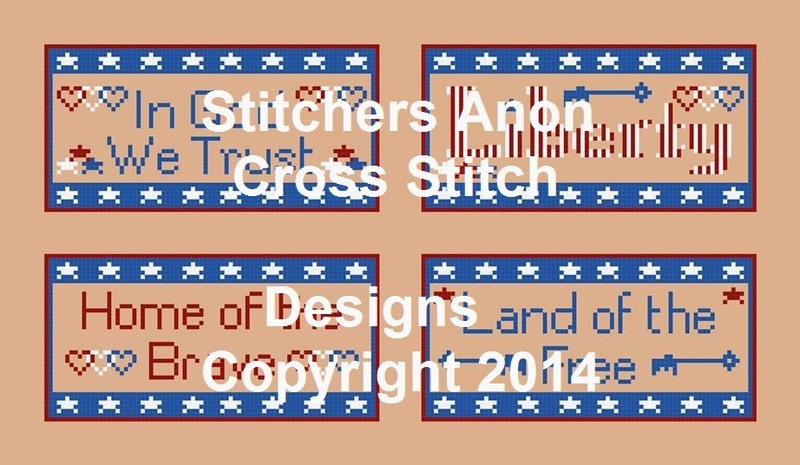 I also revamped some Patriotic ' SHORT's. Mini charts to go with this one. You can either stitch the together or as ornaments. I have to hide my designs now lol: some lovely ladies on my fb page said I was too trusting and nice and there are some copyright varmints out there! Nice haha. Not sure how this will help my sales but it is lovely to think there are stitchers out there who are looking out for me. So, please excuse me if I am not commenting on your blogs just now; I will catch up...just let me get used to the new super efficient me. Right...17.39. Blimey..into overtime! I'm off now for the fun things in life...oh yeah..I gotta go cook tea! Ah well...I will continue and see how it goes. So this is the new shoulder padded me signing off and hopefully will be back very soon with mega targets being reached and pinacles climbed! Good luck. You can do it. Great new design. hahaha ;) I truly hope this new, organized plan works wonderfully. Hmmm, I am like your old self, procrastinating all over. I wish you luck with your new self. You can do it! Procrastination happening here... I should be in the office, but am having a blog read instead, it'll get done after I make a cuppa (maybe). You go Gaynor! Wish I could get organised. I'm fine for a day then it just all goes to pot!